Our horse and carriage tour is open to everyone but intended for weddings, honeymooners, anniversary and any special occasion. 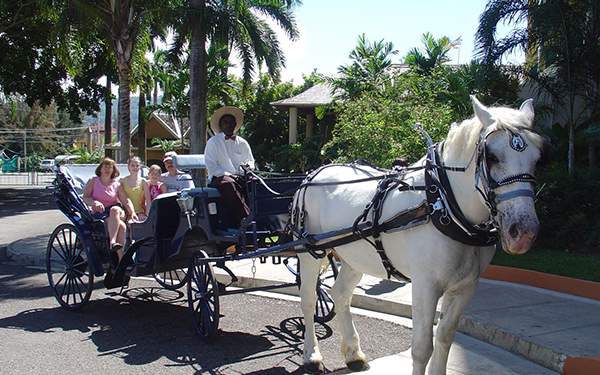 We are the only tour company in Jamaica that offers this horse & carriage tour. We have five different color carriages (white, blue, lavender, burgundy & darker blue), and the concept is to ensure that we have a color that suits the theme color of your wedding or special occasion. Our guests can request our services to be transported to any location for their weddings or special occasion, or they can book us directly to have a function on this magnificent & rustic property that allows everyone to enjoy a true ‘Nature Lover’s Paradise’. We can make you have a very fantastic wedding, and we tailor each wedding to our clients request. We are very flexible to ensure that satisfaction is achieved. We can have added value to your weddings by dressing up the carriage to make it more beautiful, using colours of flowers and ornaments that will make your wedding a very special and memorable day. We offer all-inclusive packages, included accommodations but we are not a hotel. Other carriage rides include a champagne drink & romantic ride. This tour is offered by special requests and includes music and appetizers. Surprise your love one with a Caribbean romance, champagne and a mood that refreshes your relationship for life. If you want your love one to be swept off their feet, then our carriage ride will deliver the Jamaican romance that energizes your relationship. We put some ‘pep’ in your ‘Reggae Step’. Yeh-mon !! !